Explore the monuments of Washington, DC, on this 2.5-hour segway tour. See the all the monuments DC National Mall has to offer, including the Jefferson Memorial, Washington Monument, FDR Memorial, Martin Luther King Jr Memorial, Korean Memorial, Lincoln Memorial, Vietnam Memorial and WWII Memorial. 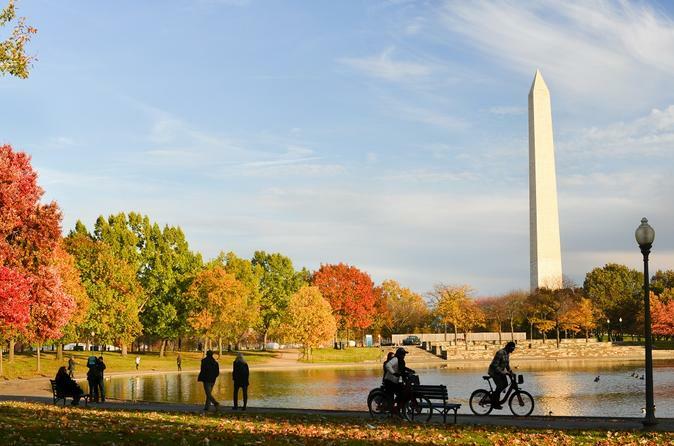 Cruise through the National Mall and around the tidal basin on your segway for a new perspective of the nation's capital. Find us at the Ronald Reagan Building on Pennsylvana Avenue. After a quick training session to make sure you are comfortable and safe during the ride, begin your tour of the National Mall in Washington, DC. Ride around the National Mall to see the monuments and landmarks starting with the Washington Monument. Then travel past the Holocaust Museum and the Engraving Bureau. View the Jefferson Memorial and then stop briefly at the FDR Memorial to walk through, or visit the Martin Luther King Jr memorial. As you cruise by the scenic tidal basin of the Potomac River you arrive at the Reflecting Pool and Lincoln Memorial. Stop to visit the Vietnam Memorial and Korean Memorial, then continue on to the World War II Memorial. End your tour with a glide down Constitution Avenue for an exciting and comprehensive segway tour of the capital's monuments.